Italy became the first major Western power to endorse China's "Belt and Road" infrastructure project (BRI) on Saturday, as the country looks for ways to revive its struggling economy. 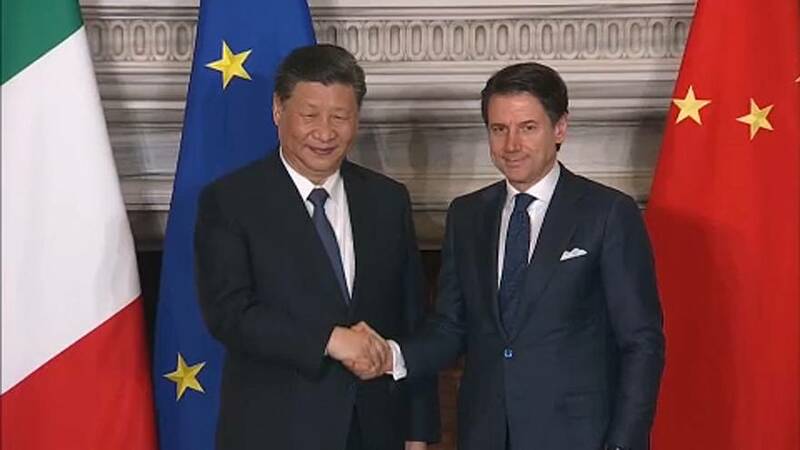 Italian Prime Minister Giuseppe Conte shook hands with Chinese President Xi Jinping at a signing ceremony after a three-day trip for the Chinese leader. Chinese and Italian firms also signed some 10 other deals in the energy, steel and gas pipeline sectors worth around €5 billion according to Italian media. However, the deal has irked Brussels and some pro-EU figures like French President Emmanuel Macron who see it as helping one of the bloc's key economic rivals. What is the 'Belt and Road' plan? The Belt and Road initiative is the centrepiece of China's foreign policy strategy and was incorporated into the ruling Communist Party Constitution in 2017, showing Xi's desire of making China a global leader. As the first G7 country to have signed the plan, the two countries signed up to more economic cooperation, especially in the areas of trade, transport, infrastructure, and connectivity. Why did Italy sign up to it? Italy's degrading economy could be the number one reason why the European country agreed to signed China's deal. Italy's populist government is anxious to lift the country from its third recession in a decade and saw China's plan as a way of helping its economy. However, not everyone in the ruling coalition supported signing the deal. Italian Deputy Prime Minister Matteo Salvini, who leads the far-right League, warned against the risk of China "colonialising" Italian markets. Salvini did not meet with Xi during his visit and even refused to attend a state dinner in honour of the guest on Friday. Italy's other Deputy Prime Minister and leader of the 5-Star Movement, Luigi Di Maio, played down those fears and pointed to the fact that Italy exports much less to China than to Germany or France. Italy had a trade deficit of €17.6 billion with China last year and Di Maio said the goal was to eliminate the deficit soon. Why doesn't the US like it? China's main economic rival, the United States fears that the plan is a strategy to strengthen China's military influence and could be used to spread technologies capable of spying on Western interests. Brussels is also not very pleased with the rapprochement between the two countries. Macron, for example, said on Friday that relations with China must not be based primarily on trade. However, Di Maio brushed off these comments and told reporters that even though Rome remained fully committed to its Western partners, it had to put Italy first when it came to business ties. The EU will meet with China for a bilateral summit on April the 9th in Brussels.